Is Moscow Developing Super Duper Secret Mega Weapons? 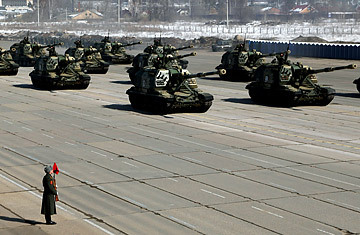 Russian self-propelled howitizer MSTA are seen during a rehearsal for the May 9 Victory Day parade at Ababino military polygon on April, 4, 2012 near Moscow. Why Are Burmese Scientists Studying Missile Technology in Moscow? Here is what the Kremlin wants you to believe about its secret weapons program: In about eight years, it may be able to warp your chromosomes, brainwash you with a "psycho-physical" mind zapper, and somehow release an invisible ray that turns diesel fuel into non-combustible goop, making engines stall within a radius of several miles. Never mind that most of this stuff would violate pretty much every law of physics. The Russian government is trying to outpace the Americans again, so propaganda is key. Physics is beside the point. The first mention of these mega-weapons came in February, when Vladimir Putin, Russia's perennial leader, published an article as part of what would be a successful campaign to win a third term as President. In the near future, he wrote, military strength will rely on a country's prowess in space and cyber warfare, but further down the line, weapons will emerge based on "new physical principles," such as "lasers, geophysics, waves, genetic engineering, psycho-physics and etc." Not only will they be at least as deadly as Russia's nukes, Putin wrote, but they will be "more acceptable in a political and military sense." That is supposed to be part of their appeal: unlike biological and chemical weapons, which are banned under international law, these would be well within bounds. Though spooky, this vague bit of military fantasy was mostly dismissed by the Russian press. In the context of Putin's other campaign promises (including his pledge to "completely re-arm" the military in five years), this seemed like just another zany bit of electoral pomp. But after the elections on March 4, when Putin won another presidential term, the government refused to let the matter drop. Defense Minister Anatoly Serdyukov brought up the ray guns again during a meeting with Putin and other top officials on March 22. By the end of this year, he told them, Russia will draw up plans to create weapons "based on new physical principles," including the genetic and psycho-physical ones that Putin mentioned in February. The minister did not explain what any of this means, but he did provide a timeframe. By 2020, he promised Putin, the Russian military will complete the development of these weapons of the future. Aside from expressing his gratitude, Putin did not respond to the Minister's remarks, but their exchange finally got the media's attention. Russian military experts began seriously to debate what the country's leadership could mean by a genetic or psycho-physical weapon, and whether such plans were even feasible or legal. On April 6, the Independent Military Review, a respected weekly newspaper, published an analysis suggesting that Putin and his Defense Minister must have gotten their terminology mixed up. Genetic weapons, it pointed out, are hardly based on "new physical principles," and more importantly, they would be banned under international law. "The use of such weapons would amount to genocide in the most basic sense of the word," the military expert Alexander Khramchikhin wrote in the analysis, which was sardonically illustrated with pictures from the Star Wars movies. The following week, however, the government's mouthpiece newspaper tried to put these skeptics in their place. Not only are these weapons possible, they were already in development in the late 1980s, claimed Rossiyskaya Gazeta, the same paper that published Putin's military article in February. "The U.S.S.R. surpassed the U.S.A. by leaps and bounds in developing weapons based on new physical principles," claimed the paper's military analyst, Sergei Ptichkin. In the final years of the Soviet Union, there were two laboratories working on these top secret projects, Ptichkin claimed. One of them managed to develop a kind of radiation that made diesel fuel stop burning for miles around, forcing tank columns to stop in their tracks. Another one, allegedly called N 10003, worked on "battlefield parapsychology." Before it was mothballed in 1991, the lab learned how to make super-human "bio-robotic killers," who could survive even the "death rays" of the enemy. In a surprising bit of humanism, the lab declined to pursue the science of "psychotronic generators," which could brainwash people at a distance, although this too was possible, Ptichkin's article suggested. The piece did not cite any sources, but when TIME reached the author on Wednesday, he claimed to have spoken with officials from the military industrial complex, who he says had direct knowledge of these projects. (Before becoming a journalist, Ptichkin worked in the Soviet military industry as an engineer.) He denied that any government official had ordered him to write that article in Putin's defense, saying simply, "We have freedom of speech, just like you." His only aim, he insisted, was to point out how easy it would be for Russia to revive the Soviet weapons programs now that it has the money to fund them. "The Minister of Defense brought this up and was accused of not knowing what he was talking about. So we had to clarify," Ptichkin says. "Russia has all this experience to draw from. For us it is a road well traveled." But in the history of arms races, the practice of military bluffing is also pretty familiar. Both Moscow and Washington used it during the Cold War, says Vladimir Rubanov, a retired KGB General. "You throw this kind of bait into the media, and the other side is supposed to bite," Rubanov tells TIME. For many years, the KGB used an allegory to teach its agents not to fall for it. This legend tells the story of a junior spy who finds an article in the press about an American military breakthrough. The article is signed by none other than Albert Einstein, so the agent rushes it over to the Ministry of Defense "with fire in his eyes," Rubanov says. After looking it over, the bosses smile and send the rookie home with a lesson: "Einstein can write whatever he wants, but talk is cheap without results." So all of Putin's talk about psycho-physical weapons should be taken with a grain of salt, says Rubanov, who headed the KGB's analytical directorate before retiring in 1993. In the late Soviet period, the military did conduct research on brain wave manipulators and other esoteric weapons, Rubanov says, but it never got very far. "It remained on the border between mysticism and fantasy." That is not to say that the Soviet Union broke no military ground. In the fields of nuclear and space technology, it was often far ahead of the U.S. But one of the greatest mistakes of the Soviet Union was its obsession with the arms race, which many experts still see as the main reason for its collapse. By most estimates, the defense budget of the U.S.S.R. was between 60% and 80% of its GDP at the height of the Cold War, says Alexander Golts, an independent military analyst in Moscow. That helped bankrupt the Soviet economy, and if Putin again wants to play catch up with his perceived rivals across the ocean, he would be pushing Russia toward a similar fate. More likely, however, he is just trying to boost public morale, says Golts. "Anyone with a television can see how far the Russian military has fallen behind the United States, and Putin has to give them these fantasies to suggest that Russia still has aces up its sleeve." So for now, there's no need to rush out for a lead helmet to deflect the Russian brainwave gun. As the KGB so nicely put it, talk is cheap without results.